Ellen Dean was born in New York, grew up in Phoenix and attended Central High School. She attended UC Berkeley and San Francisco State University earning a Masters degree in Education and counseling. Living abroad for 5 years broadened her horizons and introduced her to her husband, Craig. They have been married 39 years and have two grown children and almost 3 grandchildren. She enjoys Toastmasters and studying Spanish, loves to read, hike and travel. She has worked in business (Miracle Mile Deli), in counseling, and in education. 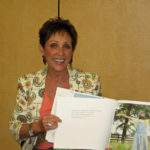 For the past 18 years she has run the BookPALS literacy program placing volunteers in disadvantaged elementary schools to read aloud to classrooms of students on a weekly basis. This program is now called The Sunshine Readers and is under the umbrella of the Andy Hull’s Sunshine Foundation. It is her joy reading to kids and letting them know they matter. She is honored to be on the board of the Sunshine Foundation.